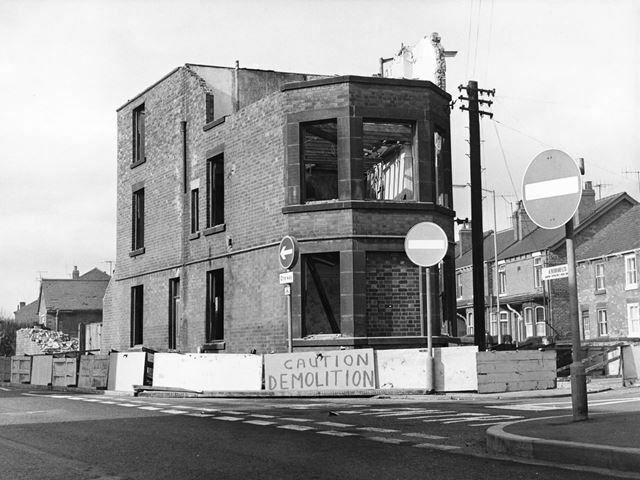 Demolition of the one-time police station at the junction of Old Road with Chatsworth Road. Built as a private house, this became the West Ward police station just before the First World War and was used as such until about 1930. A letter from a V L Margereson to the 'Derbyshire Times' newspaper at the time of its demolition recalled that 'the house was built in the 1890s as a private residence with stables for my late father who was an auctioneer and postmaster of New Brampton. The front part of the house was used as the post office and later as a doctor's surgery. It was sold to the Corporation just before the first World War and was then used as a police station in the charge of the late Inspector Arnold. It was converted into two houses at a later date'.